First of all an Afro scalp like other skin types presents symptoms such as irritation, inflammation, erythema and dryness. Furthermore, skin diseases affect all skin types alike. Similarly, the Afro Scalp tends to suffer from certain skin problem more than others because of the way it is managed. Also, Afro Hair is naturally dry and brittle therefore too much washing tends to add to this issue. Unfortunately, incorrect cleansing causes issues with the skin. Hence the saying dammed if you do dammed if you don’t springs to mind. Furthermore the use of chemical treatments such as relaxers and curly perms are other major causes of scalp reactions. Also the use of products that remain on the scalp for long periods of time. These are just some of the issues that cause problems for Black men and women. Most noteworthy here are some of the conditions that may be affecting you. Scalp Psoriasis, Scalp Eczema, Contact Dermatitis, Lupus, Scarring Alopecia, Dry scalp, Itchy Scalp, Favus and many more. The menu will show all. Above all treating such issues in most cases can be achieved quickly if dealt with properly. We have proven methods to deal with such conditions. Perhaps we can help you? Hence why don’t you give us a ring and have a phone consultation with a Trichologist. Alternatively, book a consultation at the clinic. Diagnosing the condition is the first thing we must achieve. After which we can offer if appropriate a course of treatment. Treatments may be a one off or involve a number of visits. Our treatments are unique, gentle and very effective. The key is to remove the crusting that effectively blocks the skin causing an increased immune response. Removing the crusting is a specialist role and should not be attempted at home. You may well damage the skin and cause a secondary infection. Afro Scalps like that of other skin types are susceptible to contact reactions. This may leave the scalp feeling, itchy, dry, red, hot, tight, inflammed and in some cases painful. Spots may appear along with dandruff or the shedding of clumps of skin. Reactions may be a result of chemical processing as well as the simply application of conditioning treatments. Steaming as well in some cases may cause issues. The key to dealing with this type of issue is to remove the cause. Easier said than done as the skin after such trauma tends to speed up in its cycle (proliferation) making it very difficult to deal with a contact reaction by just removing the cause. The Afro scalp in many cases will need to be professionally cleansed resulting in the skin cell production slowing and the scalp calming down. Most Afro scalps are not cleaned enough and may lead to scalp problems and hair loss. You may be asking the question “but if we wash the hair too much it will become dry and break off more”. You are correct to a point however, the scalp and the face needs to be washed regularly. Would you leave your face for week without washing? We have methods and treatments for those seeking to keep the scalp much cleaner therefore preventing scalp issues. Afro hair is often dry, which tends to encourage infrequent shampooing and the scalp sometimes suffering the consequences. The scalp plays host to a natural yeast bacillus (Pityrosporon Ovale) which if not controlled can multiply extensively resulting in an irritated, inflamed scalp which can lead to secondary infection. Successfully cleansing afro scalp and hair is not and easy process. Lack of correct cleansing may well be the cause. However, once the itchy scalp condition is apparent, simply washing the hair tends not to solve the problem. So correct cleansing of the afro scalp requires an excessive rinsing regime and can often be overlooked. Afro scalp & hair must be rinsed very thoroughly (laboriously). In order to remove all traces of detergent a rinsing time of up to 10 minutes should be adopted for persons with an average hair compliment. This would increase with longer thicker density of afro hair. Where detergents are insufficiently rinsed away the afro scalp may suffer a contact reaction which can lead to a dry itchy scalp which may burn. Symptoms may include: pruritis (irritation), erythema (inflammation) and the presence of scales (commonly known as ‘dandruff’). There is no ‘right’ or ‘wrong’ answer to the question “How often should I shampoo?”. You need to establish a routine that cleanses your scalp adequately. We deal with all types of scalp conditions for Afro Scalps. Give us a call and let us help you. Thank you. Like other skin types the Afro Scalp is prone to skin ailments that may present symptoms similar to that of a contact reaction. Therefore when dealing with a skin disease such as Psoriasis, or Eczema the correct care and in some cases treatment should be sought. There are some skin conditions that can lead to permanent hair loss and scarring. Afro Scalp are prone to Keloids. Most skin conditions can be dealt with or controlled. 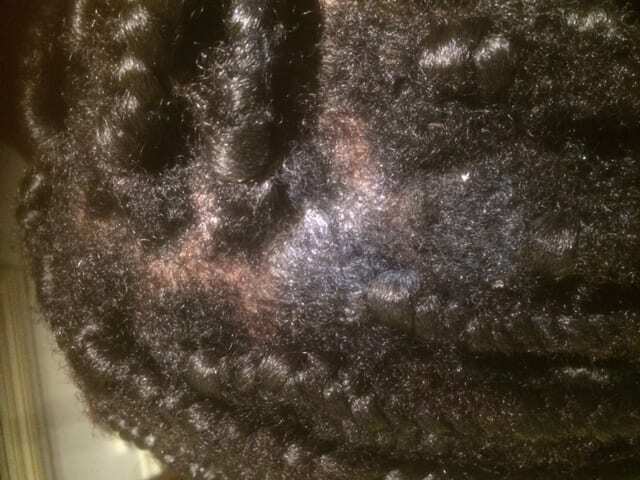 The correct diagnosis is necessary because some treatments will aggravate a afro scalp disease and not help it!. We are Afro Scalp Specialists who can deal with most types of disease. The following is a list of conditions that may present as scaly irritable scalp viz Eczema, Psoriasis, Pityriasis, Seborrhoiec Dermatitis & Allergic Irritant Scalp Reactions. If symptoms persist, professional advice should be sought because of the dangers of scarring. This site contains a wealth of information on the various hair and scalp conditions affecting the Afro Scalp and a jump menu at the top of the page. We hope that you will find this useful. If you have any particular questions then why not give us a call or email us. A free telephone consultation with a registered TTS Trichologist can be arranged offering advice on the many hair loss and skin diseases that affect the human body. We are specialists in this field and have assisted thousands of patients. If you would like to arrange a consultation please ring us or fill in the contact form at the top and bottom of the page. This is always the best way to be diagnosed and to have the best possible advice and treatment for your afro scalp ailment. Thank you.